Since March is National Noodle Month – thank you, National Pasta Association – we’re celebrating by delving into the vast world of pasta and noodles. Though its history is tangled, pasta has been an American favorite for generations. The United States consumes nearly 6 billion pounds of pasta every year, and the popularity of pasta increases 20 percent during winter. As ubiquitous as it’s become, pasta still has a mysterious past, and its present-day place in American culture isn’t totally straightforward, either. 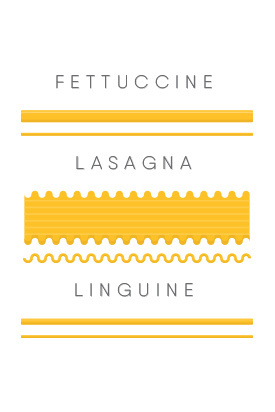 How many types of pasta are there? 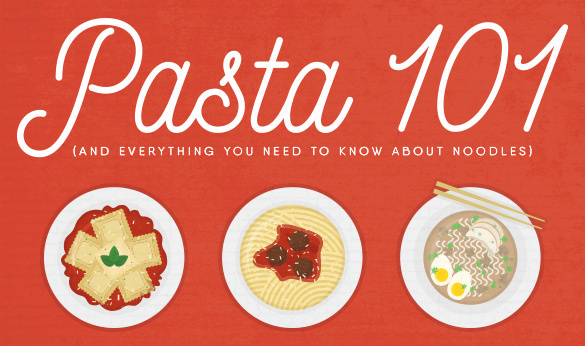 What’s the difference between pasta and noodles? This guide boils down the answers to those questions and more. Pasta’s history is as varied as the shapes and types it comes in, as modern experts continue to argue over where pasta originally came from. They mostly agree that it was somewhere in Asia, though some sources claim that its origins stem from ancient Etruscans. How pasta moved westward is also a hotly debated topic, with at least one theory crediting nomadic Arabs. Although pasta’s journey from Asia to Italy is unclear, the country is famous for its pasta dishes. Recipes can be found in Italian cookbooks as far back as the early 1200s. English noblemen toured Italy in the 18th century and brought the food back with them, which in turn was brought to the United States. Although pasta had been introduced in America, it apparently didn’t gain popularity until Thomas Jefferson returned from his 1789 tour of Europe with two cases of macaroni (and if you didn’t know, now you know, Mr. President). Pasta vs. Noodles: Who’s the Impasta? I’m sure many of you have had this debate before: Are pasta and noodles the same thing? Should we use these terms interchangeably? As it turns out, we should not. 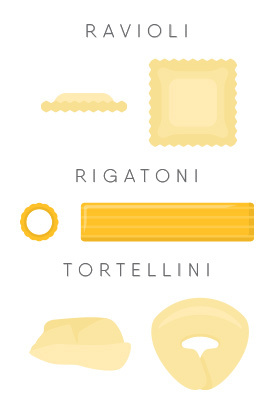 The difference between pasta and noodles begins in the creation process. Pasta is typically made from durum – also known as semolina – with flour and water to create a stiff dough that is molded into a variety of shapes. Noodles are made from a variety of different kinds of flour and formed into unleavened dough then rolled into a flat sheet and sliced. Once cooked, there are obvious differences in their textures. Pasta is typically cooked to al dente, where it is soft on the outside yet firm to the bite. Depending on what style of dish you prepare, noodles typically have varying degrees of firmness and softness but tend to be springy. Most of us meet pasta once it has been dried and packaged in a box, waiting to be boiled and transformed into decadent dishes. This type of pasta is usually referred to as “refined” since the wheat has been enriched by removing bran and germ from the grain. Whole-wheat pasta is also derived of wheat, but most of the bran and germ stay in the grain to retain more vitamins, minerals, and fiber. Most Italian pastas are prepared with semolina flour, water, and salt when dried and flour and eggs when fresh. For those who can’t enjoy traditional pastas due to Celiac disease or other dietary restrictions, a variety of alternatives are quickly gaining popularity. Rice noodles, a combination of rice flour and water, are a great gluten-free option. Lentils are another noodle alternative; they are prepared exactly like traditional pasta but have almost four times the amount of fiber. Shirataki noodles are made of glucomannan (also known as konjac) flour, water, and lime water, being virtually almost all water with hardly any carbohydrates. Of course, we can’t forget about zoodles, a trendy low-carb noodle alternative. While zoodles are made of spiralized zucchini, a variety of vegetables can be spiralized for a noodle substitute, including carrots, spaghetti squash, and sweet potatoes. 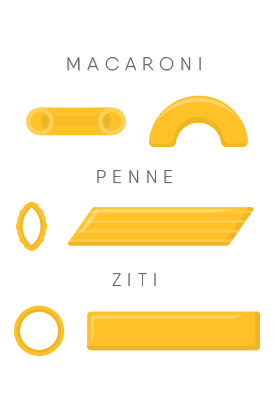 There are over 600 pasta shapes, but you’ll find information about the most commonly seen shapes below. 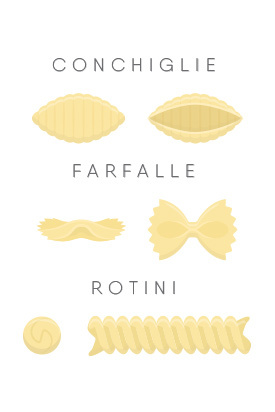 Ribbon-shaped pasta could be considered a subcategory of strands. They are usually flat and vary in width. 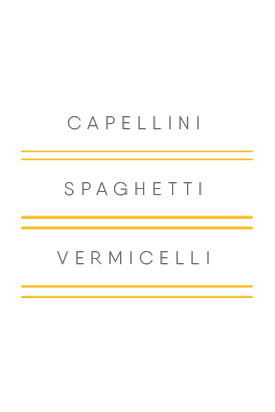 Shape pastas are short and typically retain their structure, making them perfect for salads, soups, and sides. Strand pasta is also referred to as long form pasta due to its length. These are round with varying diameters. This category obviously received its name since the pasta is stuffed, traditionally with cheese, meat, vegetables, or seafood. While similar to strand, this short form pasta is hollow, hence being called tubular. Now that we know pasta is divergent from noodles, we have a category dedicated to Asian noodles. As previously stated, noodles tend to be bouncy when cooked and can range in texture.